Barack Obama is the 44th president of the United States and the first African-American president. After eight years in office, President Obama delivered a farewell address to the American people in Chicago on Jan. 10, 2017. 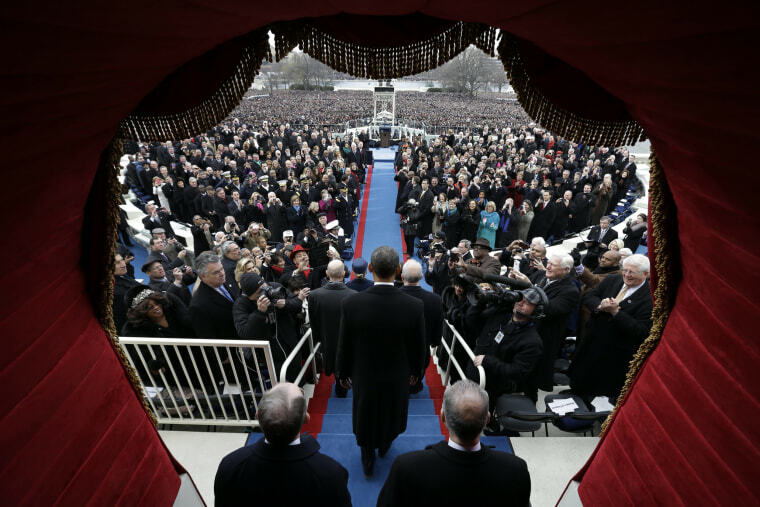 Here's a look back at the tenure of Barack Obama, from Obamacare, his signature legislative achievement, to the mission that killed Osama bin Laden, the mastermind behind the Sept. 11 attacks, to a presidential visit to Cuba, the first in nearly 90 years. 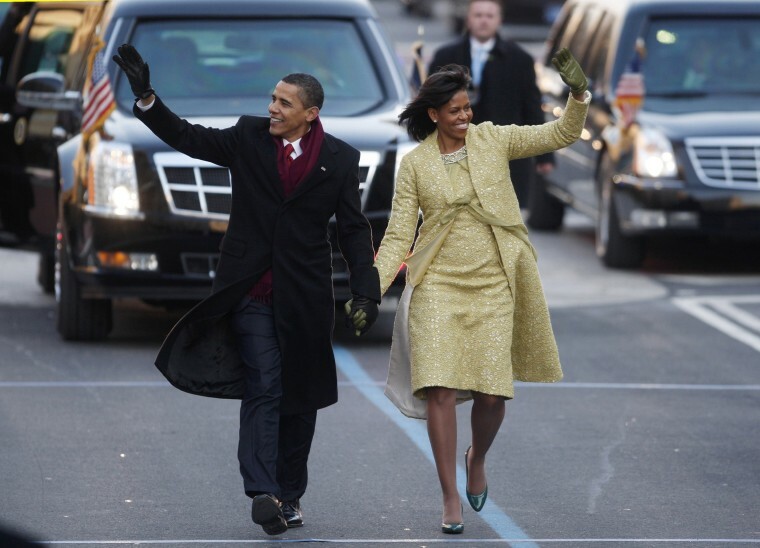 Above: President Barack Obama waves as he and his wife Michelle walk down Pennsylvania Avenue during the Inaugural parade in Washington on Jan. 20, 2009. President Obama snuggles with the first lady in a freight elevator at one of the inaugural balls on Jan. 20, 2009. 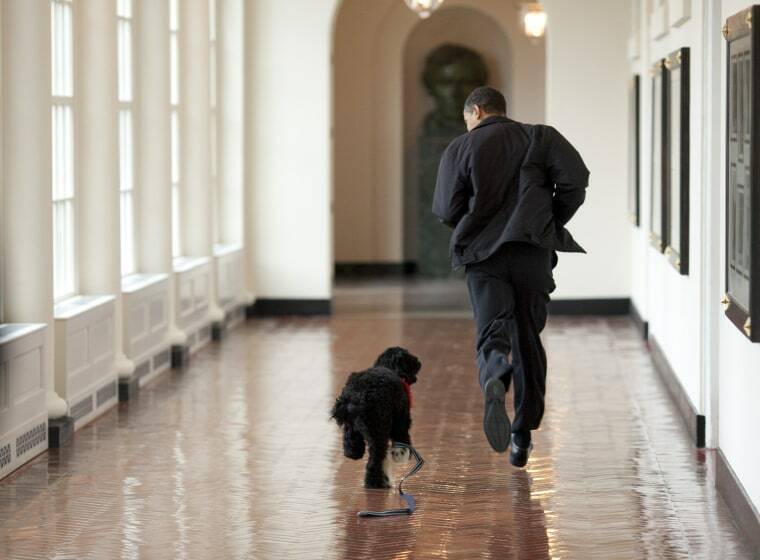 President Obama welcomes the family's new puppy, Bo, at the White House on March, 15, 2009. 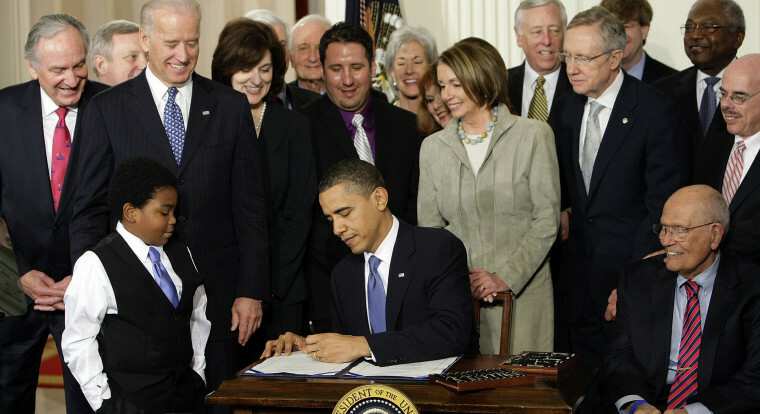 President Obama signs the Affordable Care Act, popularly known as Obamacare, in the East Room of the White House on March 23, 2010. Considered by many to be Obama's most significant legislative achievement, President-elect Donald Trump and the GOP Congress have vowed to repeal and replace the law. 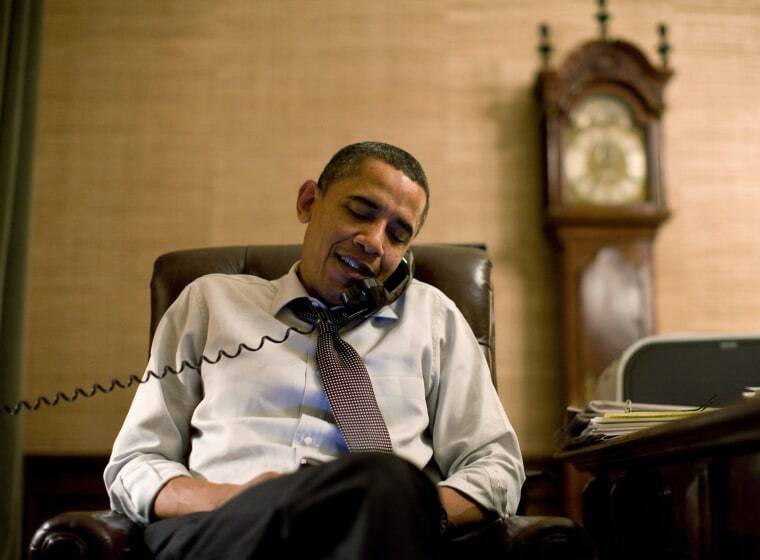 President Obama phones incoming House Speaker John Boehner to congratulate him on his election victory from his Treaty Room office in the White House residence, a couple of minutes after midnight, on Nov. 3, 2010. The GOP regained control of the House in midterm elections. 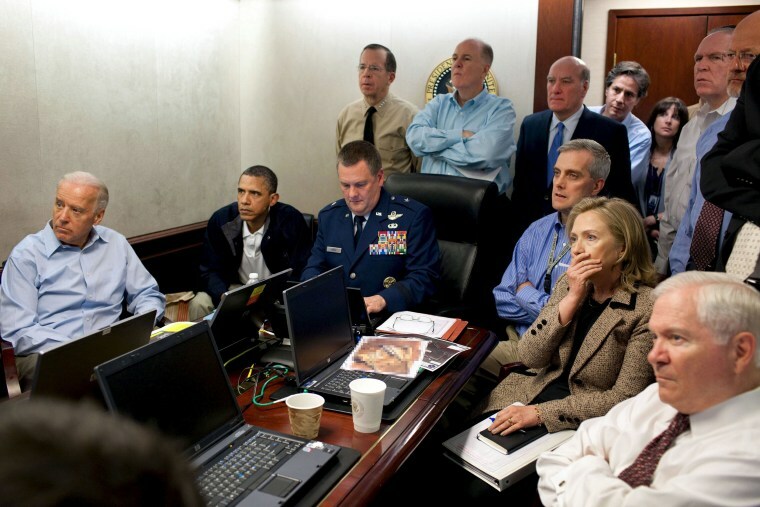 President Obama, Vice President Joe Biden, Secretary of State Hillary Clinton and other members of the national security team receive an update on the mission against Osama bin Laden in the Situation Room of the White House on May 1, 2011. Bin Laden, the mastermind behind the Sept. 11 terror attacks that killed thousands of Americans, was slain in his luxury hideout in Pakistan in a firefight with U.S. forces, ending a manhunt that spanned a frustrating decade. 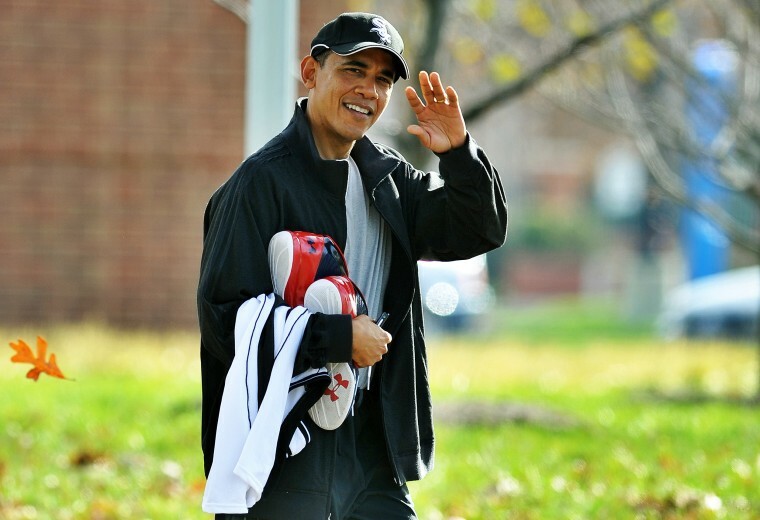 President Obama waves as he walks to his car after playing basketball at Fort McNair in Washington on Nov. 26, 2011. Concerned about injury, the well-known hoops lover played less basketball in his second term. In 2010 he needed 12 stitches on his upper lip after getting an elbow to the mouth during a pickup game. 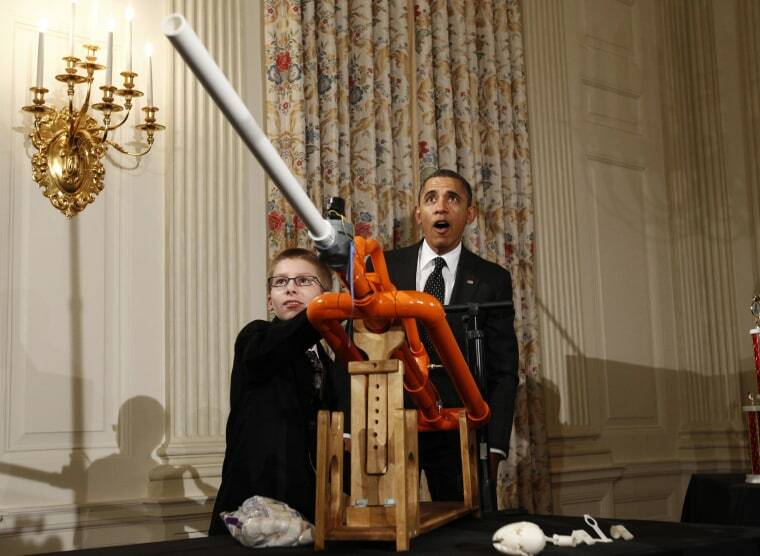 President Obama reacts as Joey Hudy of Phoenix, Arizona, launches a marshmallow from his Extreme Marshmallow Cannon in the State Dining Room at the White House Science Fair on Feb. 7, 2012. The fair celebrates the achievements of student winners of a broad range of science, technology, engineering and math (STEM) competitions from across the country. Vice President Joe Biden talks to customers during a stop at Cruisers Diner on Sept. 9, 2012, in Seaman, Ohio. 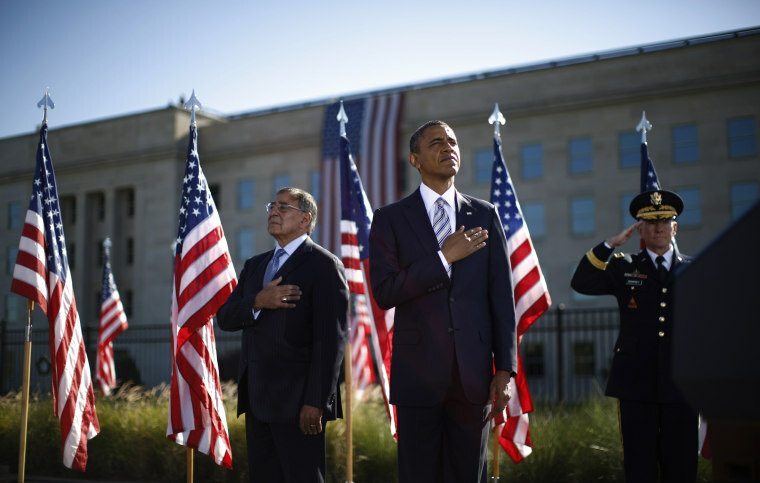 President Obama, Secretary of Defense Leon Panetta, left, and Chairman of the Joint Chiefs of Staff Martin Dempsey attend an event at the Pentagon on Sept. 11, 2012, commemorating the 11th anniversary of the attacks that killed nearly 3,000 people in New York, Washington, D.C., and Shanksville, Pennsylvania. 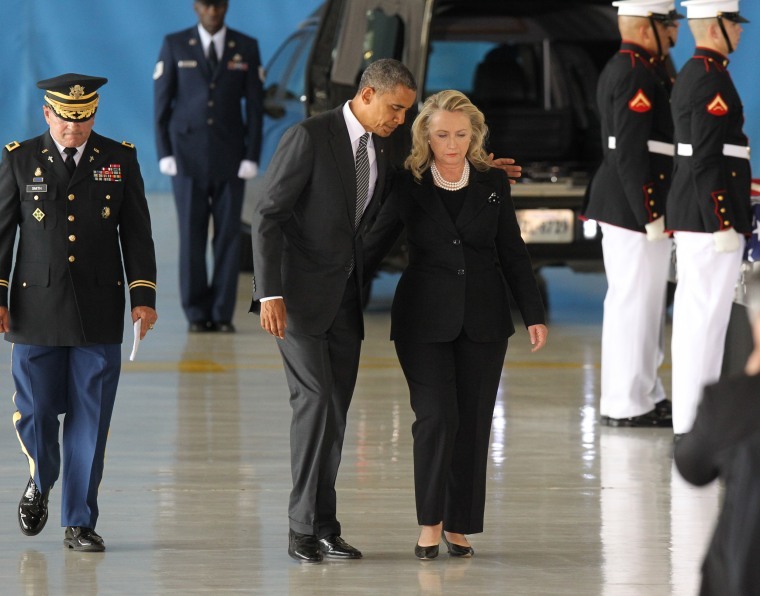 President Obama and Secretary of State Hillary Clinton walk away from the podium during the Transfer of Remains Ceremony for the return of Ambassador Christopher Stevens and three other Libyan embassy employees at Joint Base Andrews on Sept. 14. 2012 in Maryland. Stevens and the other embassy employees were killed when the consulate in Benghazi, Libya was attacked on Sept. 11, 2012. 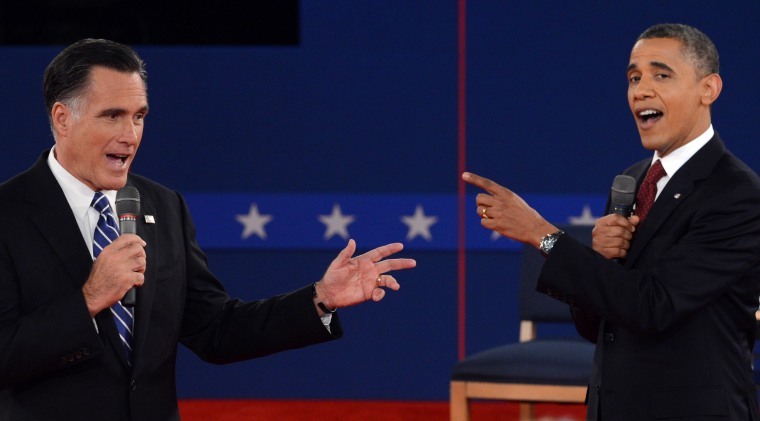 President Obama and Republican presidential candidate Mitt Romney face off in the second presidential debate, the only held in a townhall format, at the David Mack Center at Hofstra University in Hempstead, New York, on Oct. 16, 2012. 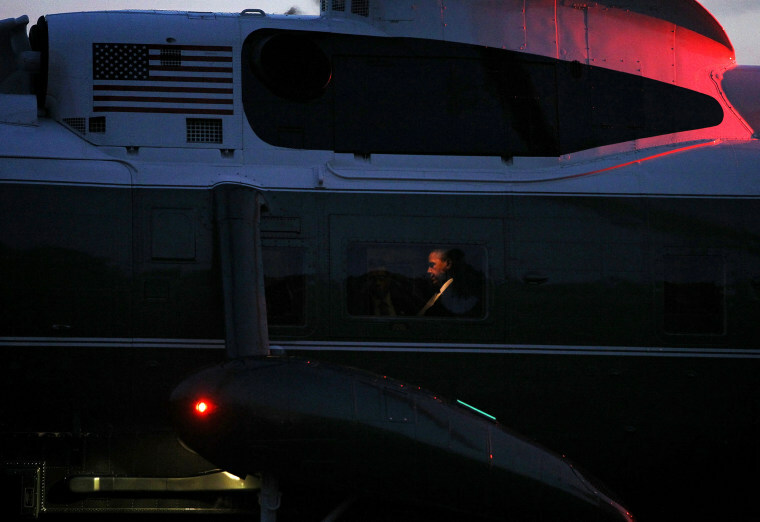 President Obama sits aboard Marine One as it lands on the South Lawn of the White House on Oct. 23, 2012. Obama was returning from campaign events in Florida and Ohio following the third and final presidential debate. 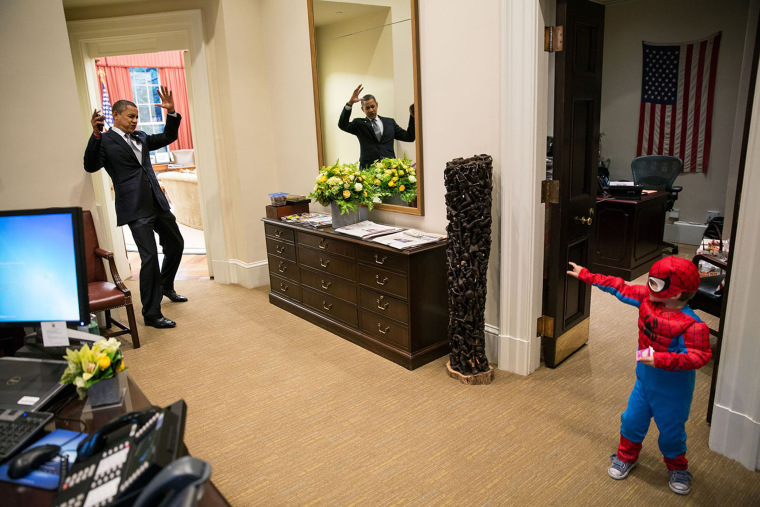 President Obama pretends to be caught in Spider-Man's web as he greets Nicholas Tamarin, 3, just outside the Oval Office on Oct. 26, 2012. Spider-Man had been trick-or-treating for an early Halloween with his father, White House aide Nate Tamarin in the Eisenhower Executive Office Building. 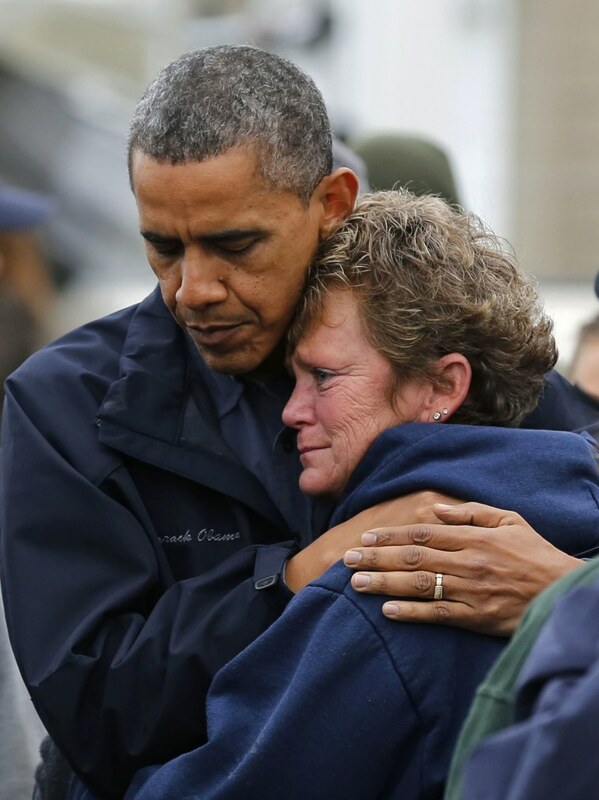 President Obama hugs North Point Marina owner Donna Vanzant as he tours damage done by Hurricane Sandy in Brigantine, New Jersey, on Oct. 31, 2012. 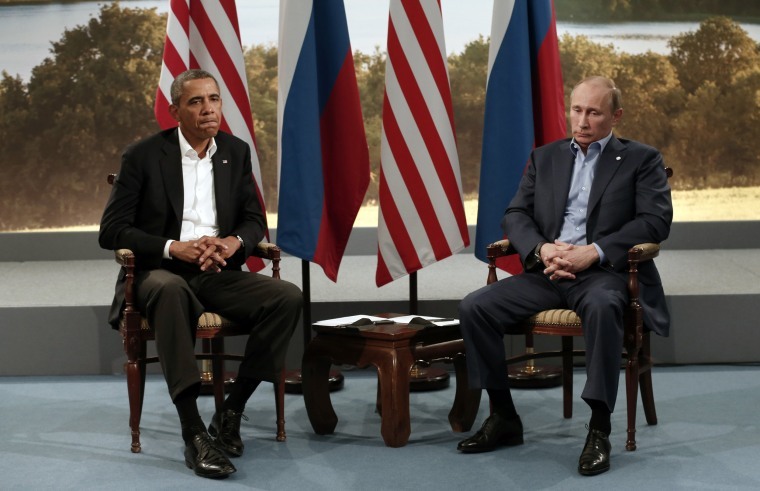 Putting aside partisan differences, Obama and Republican Gov. Chris Christie toured storm-stricken parts of New Jersey together, taking in scenes of flooded roads and burning homes in the aftermath of superstorm Sandy. 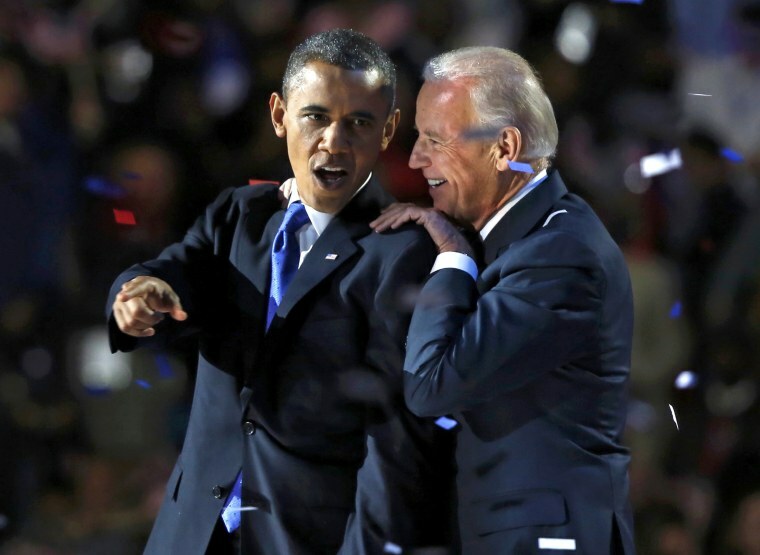 President Obama huddles with Vice President Joe Biden after his election night victory speech in Chicago on Nov. 6, 2012. Obama told Americans "the best is yet to come" after defying dark economic omens to handily defeat Mitt Romney. 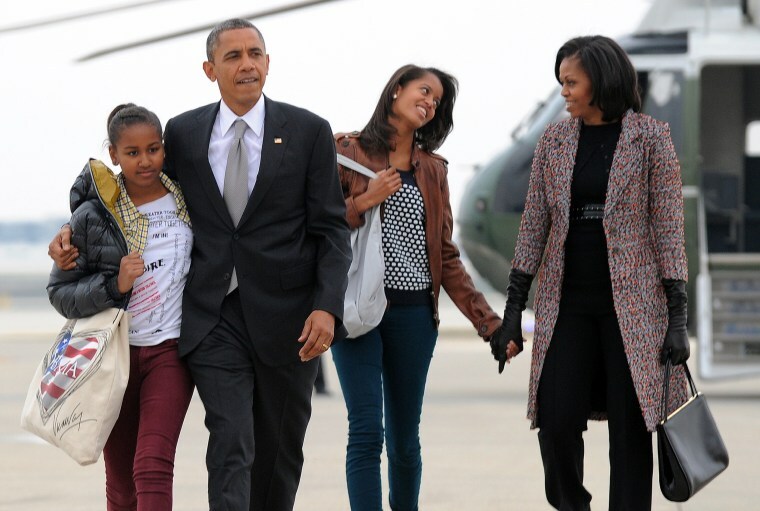 President Obama, first lady Michelle and their daughters Sasha, left, and Malia board Air Force One in Chicago on Nov. 7, 2012. Obama returned to Washington emboldened by his re-election but facing the daunting task of breaking down partisan gridlock in a bitterly divided Congress. 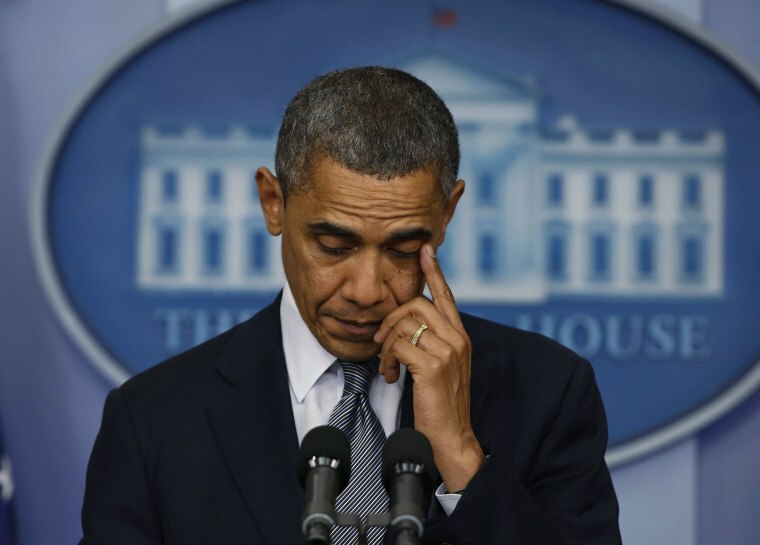 President Obama speaks about the shootings at Sandy Hook Elementary School in Newtown, Connecticut, during a press briefing at the White House on Dec. 14, 2012. A heavily armed gunman opened fire on school children and staff at the elementary school, killing 20 first-graders and six educators. 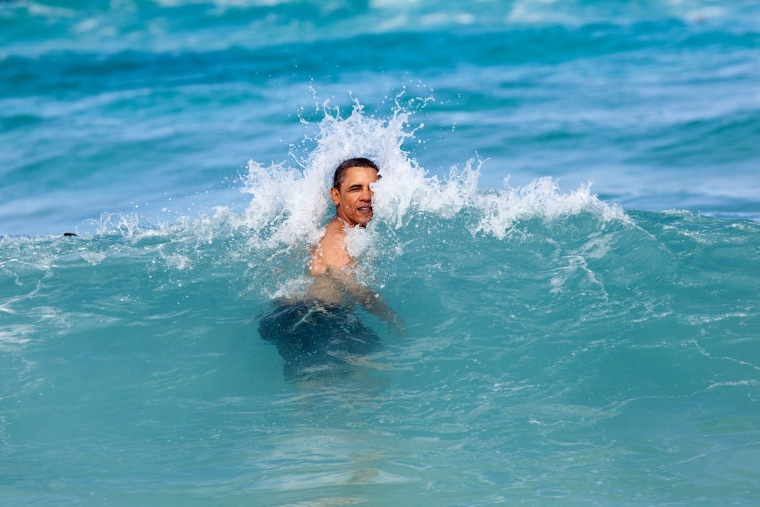 President Obama jumps into the ocean at Pyramid Rock Beach on Jan. 1, 2013 in Kaneohe Bay, Hawaii. The Obamas typically spend Christmas and New Year's in Hawaii, the president's native state. President Obama arrives for his second term swearing-in at the Capitol on Jan. 21, 2013. 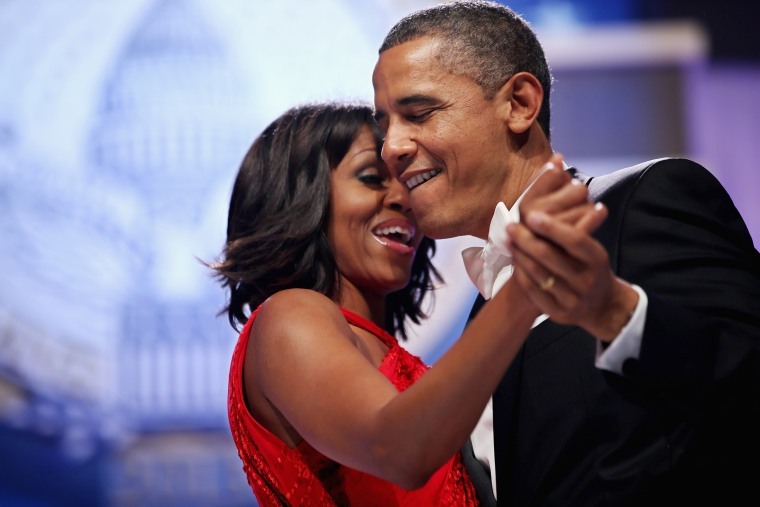 President Obama and first lady Michelle sing together as they dance during the Inaugural Ball at the Walter Washington Convention Center on Jan. 21, 2013 in Washington. 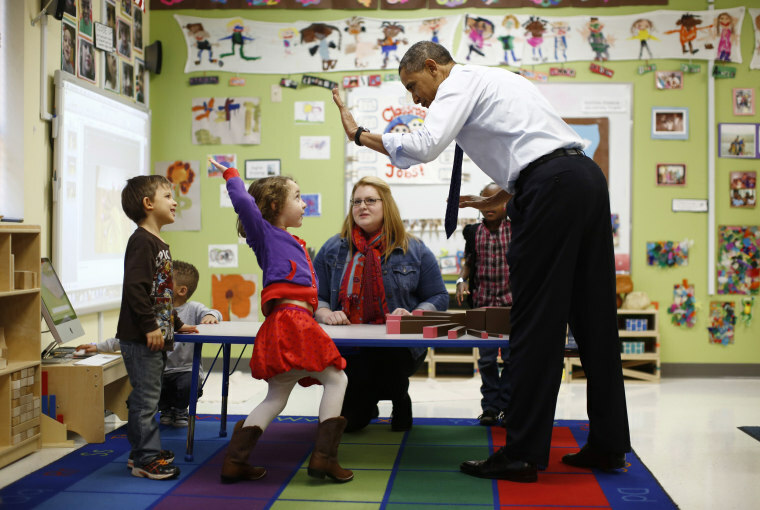 President Obama high-fives children in a pre-kindergarten classroom at College Heights early childhood learning center in Decatur, Georgia, on Feb. 14, 2013. Obama flew to Georgia to push his plan to ensure high-quality preschool, unveiled during his State of the Union address earlier in the week. President Obama meets with Russian President Vladimir Putin during the G8 Summit at Lough Erne in Enniskillen, Northern Ireland, on June 17, 2013. 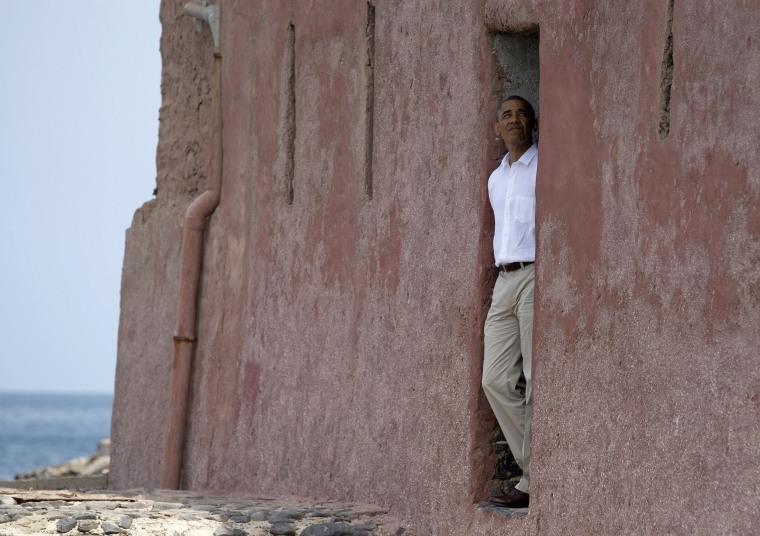 President Obama looks out of the "door of no return" during a tour of Goree Island, Senegal, on June 27, 2013. The island is the site of the former slave house and embarkation point built by the Dutch in 1776, from which slaves were brought to the Americas. The "door of no return" was the entrance to the slave ships. 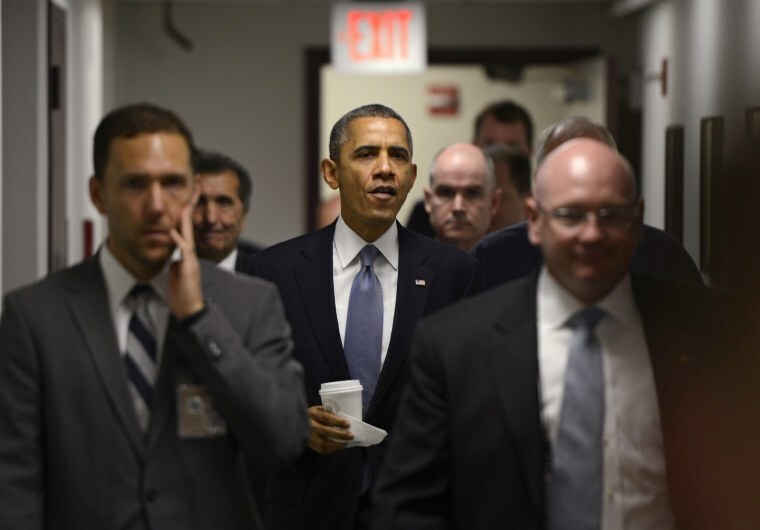 President Obama walks to a briefing to deliver remarks on the government shutdown at FEMA's National Responce Coordination Center in Washington on Oct. 7, 2013. The first government shutdown in 17 years came after lawmakers reached an impasse on a bill to finance the government past Sept. 30. The Senate rejected measures passed by the Republican-led House on Monday that would have delayed key portions of the Affordable Care Act while extending funding for a few weeks. 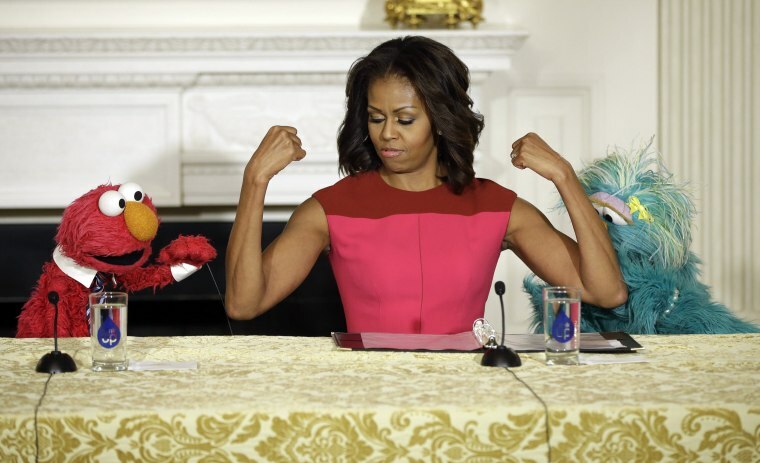 First lady Michelle Obama, center, flexes her arms for Sesame Street characters Elmo, left, and Rosita, right, during an event to help promote fresh fruit and vegetable consumption in the State Dining Room of the White House on Oct. 30, 2013. Michelle Obama championed a healthier nation during her time as first lady, installing a new garden on the South Lawn of the White House and leading the Let's Move! initiative, where she took on childhood obesity and lack of access to healthy food. 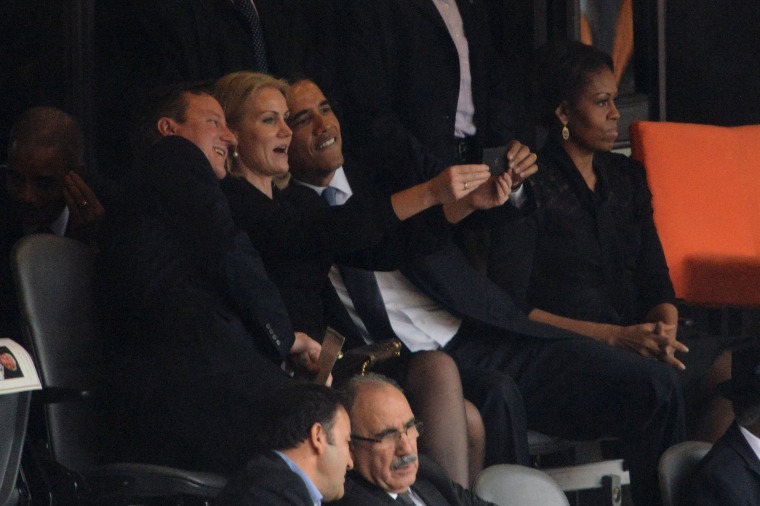 President Obama and British Prime Minister David Cameron pose for a selfie with Denmark's Prime Minister Helle Thorning Schmidt as first lady Michelle Obama looks on during a memorial service for former South African President Nelson Mandela at the FNB Stadium in Johannesburg on Dec. 10, 2013. Mandela, the revered icon of the anti-apartheid struggle in South Africa and one of the towering political figures of the 20th century, died at age 95. 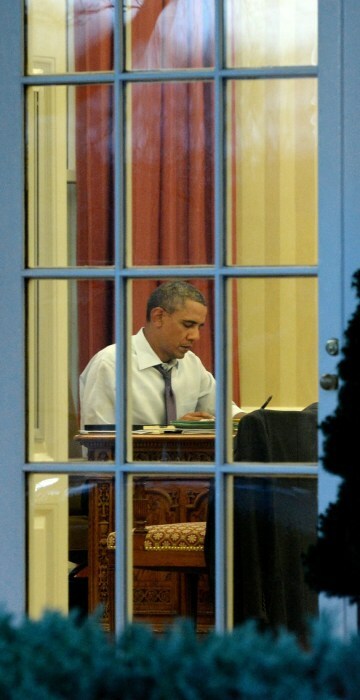 Seen through a window of the Oval Office, President Obama works on a draft of his State of the Union address on Jan. 27, 2014. 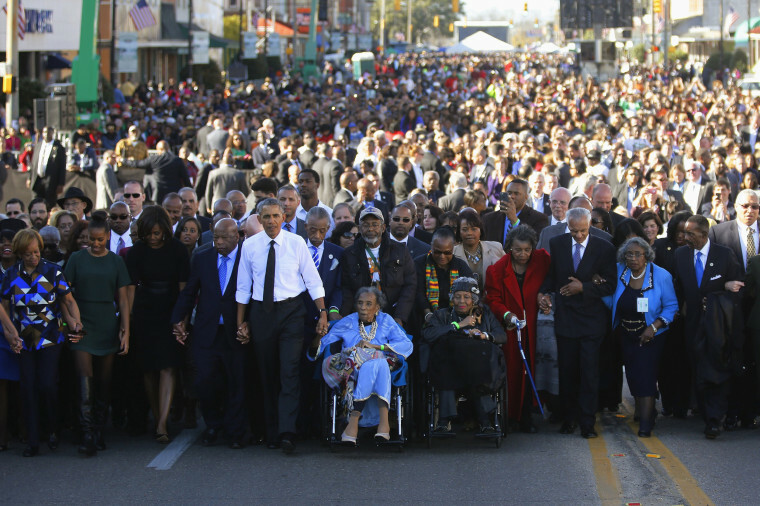 President Obama, at left in white shirt, joins in a march across the Edmund Pettus Bridge in Selma, Alabama, on March 7, 2015. Marching with him are, from left, Obama's mother-in-law Marian Robinson, daughter Sasha, first lady Michelle and Rep. John Lewis. The Obamas joined thousands in Selma to honor the sacrifice and bravery of the men and women who bled there in 1965, in support of voting rights for all African Americans. 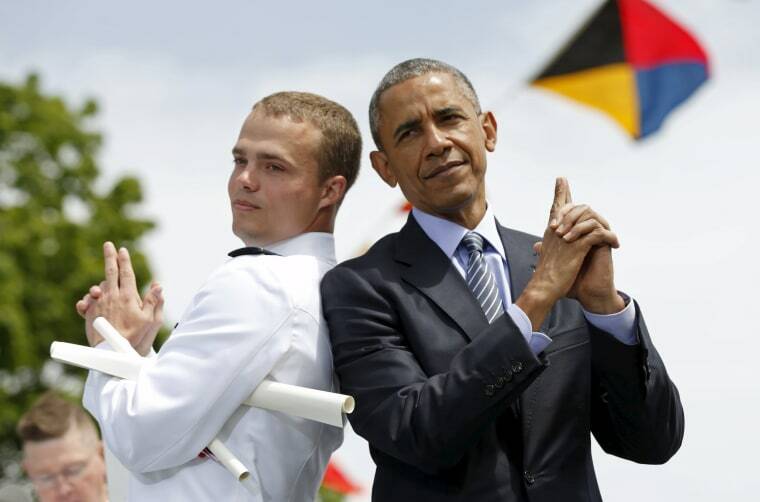 Graduate Robert McConnel asks President Obama to strike a "James Bond" pose during the 134th Commencement Exercises of the United States Coast Guard Academy in New London, Connecticut, on May 20, 2015. 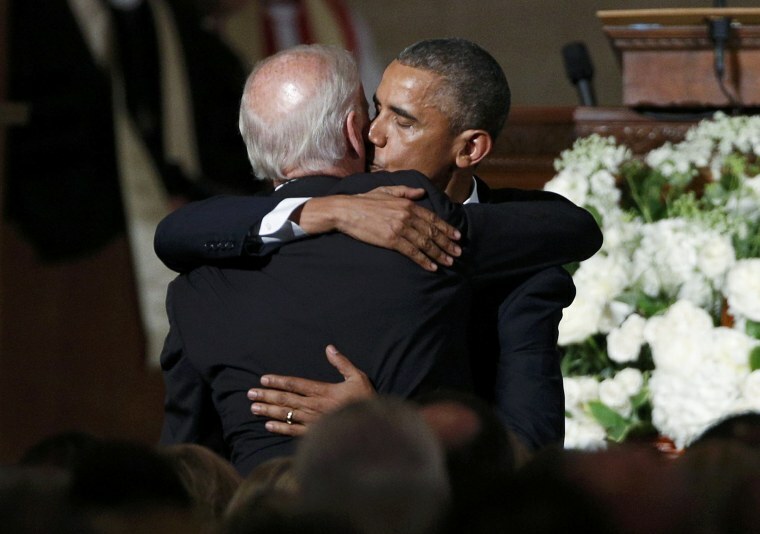 President Obama embraces Vice President Joe Biden after delivering the eulogy during the funeral of Biden's son, former Delaware Attorney General Beau Biden, at St. Anthony of Padua church in Wilimington, Delaware, on June 6, 2015. Beau Biden died of brain cancer. The vice president cited his family's painful mourning process as the primary reason he declined to run for president in 2016. 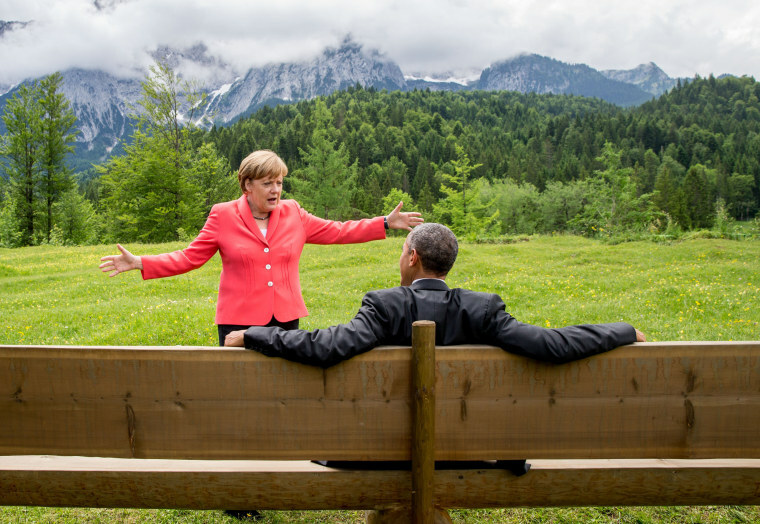 German Chancellor Angela Merkel speaks with President Obama at Schloss Elmau Hotel near Garmisch-Partenkirchen, southern Germany, on June 8, 2015, during the G-7 summit. 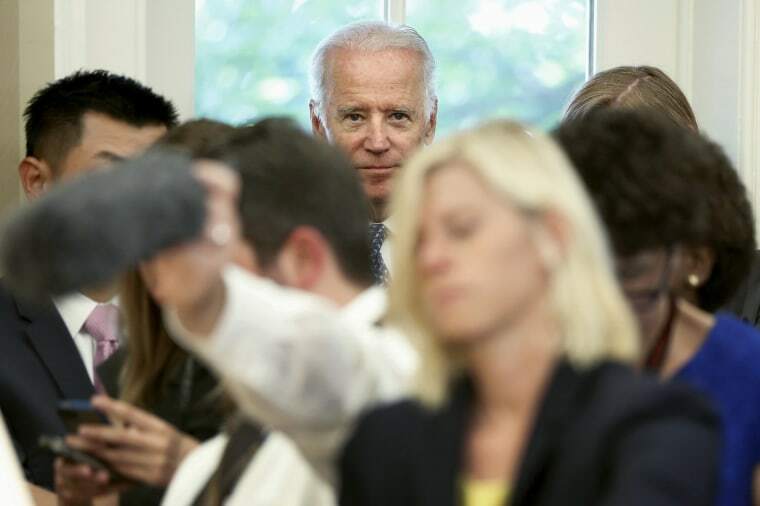 Vice President Joe Biden stands behind reporters as President Obama and U.N. Secretary-General Ban Ki-moon make statements after their meeting in the Oval Office on Aug. 4, 2015. 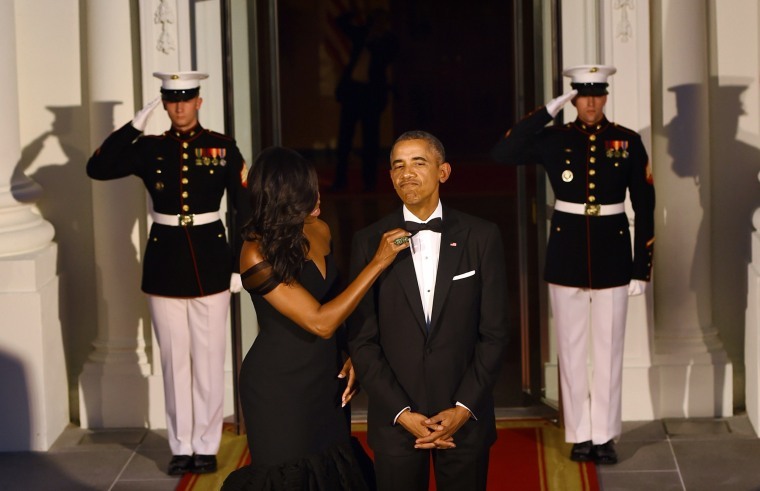 First lady Michelle Obama adjusts the president's tie as they await the arrival of Chinese President Xi Jinping and his wife Peng Liyuan at the White House on Sept. 25, 2015. 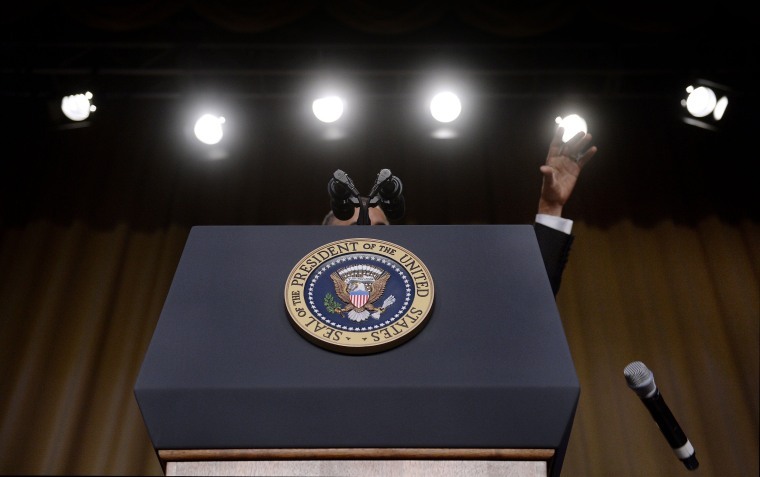 President Obama drops the microphone after he speaks during the White House Correspondents' Association annual dinner on April 30, 2016 at the Washington Hilton. 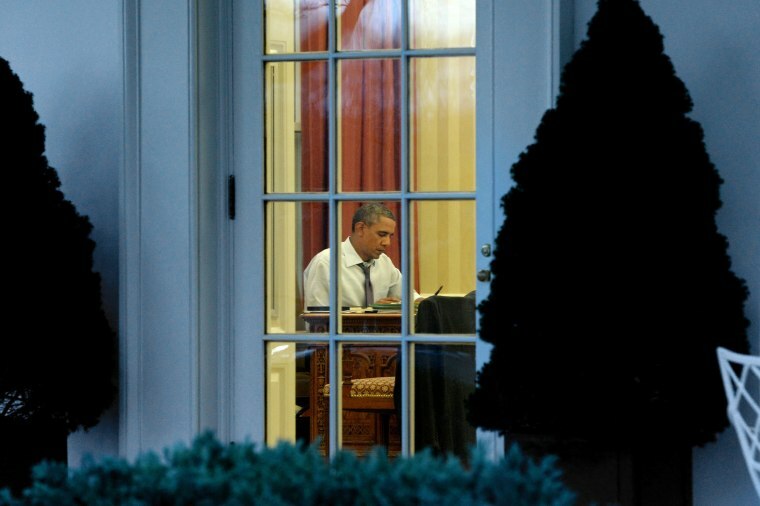 It was Obama's eighth and final White House Correspondents' Association dinner. 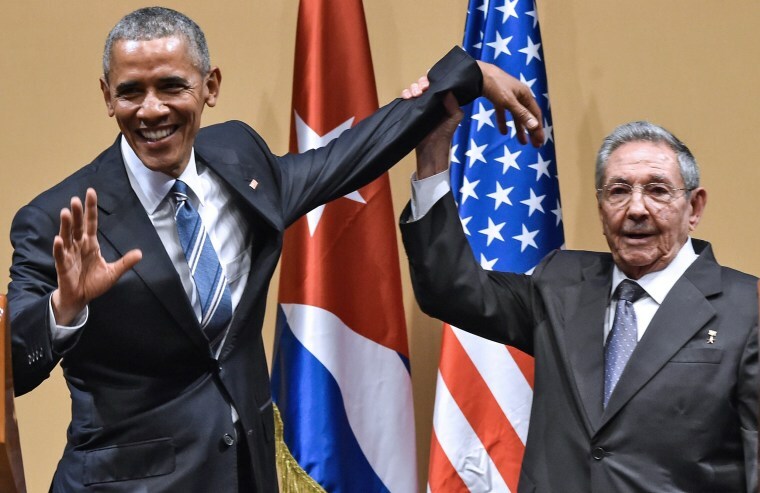 Cuban President Raul Castro raises President Obama's hand during a meeting at the Revolution Palace in Havana on March 21, 2016. Obama became the first sitting American president to visit Cuba in nearly 90 years. 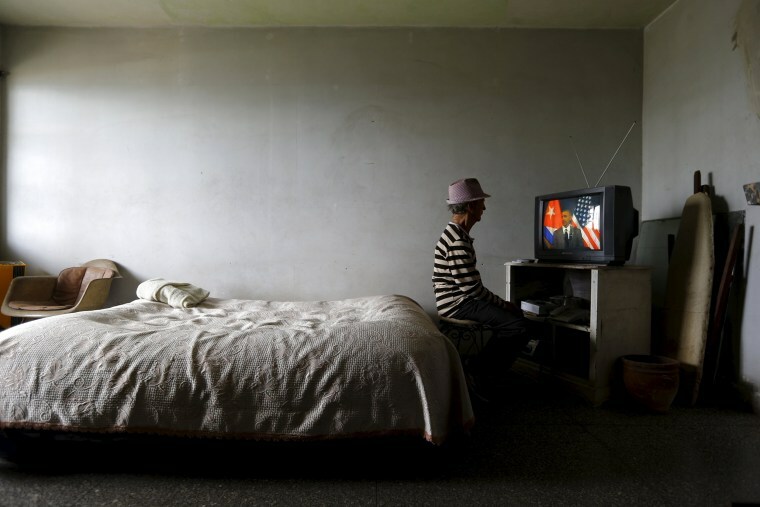 A Cuban man watches President Obama deliver a nationally televised address at the Grand Theater in Havana on March 22, 2016. In his speech, Obama urged Cubans to look to the future with hope, casting his historic visit to the island nation as a moment to "bury the last remnant of the Cold War in the Americas." 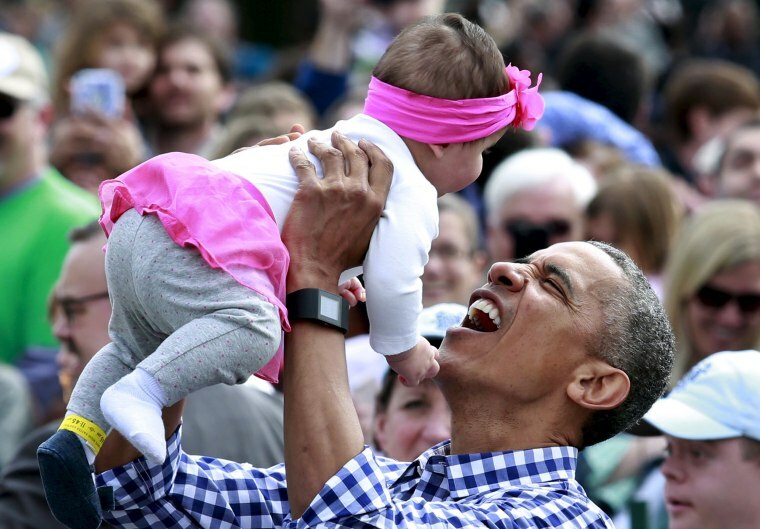 President Obama lifts a baby during the White House Easter Egg Roll on March 28, 2016. President Obama and his daughter Malia walk from Marine One to board Air Force One as they depart Los Angeles on April 8, 2016. 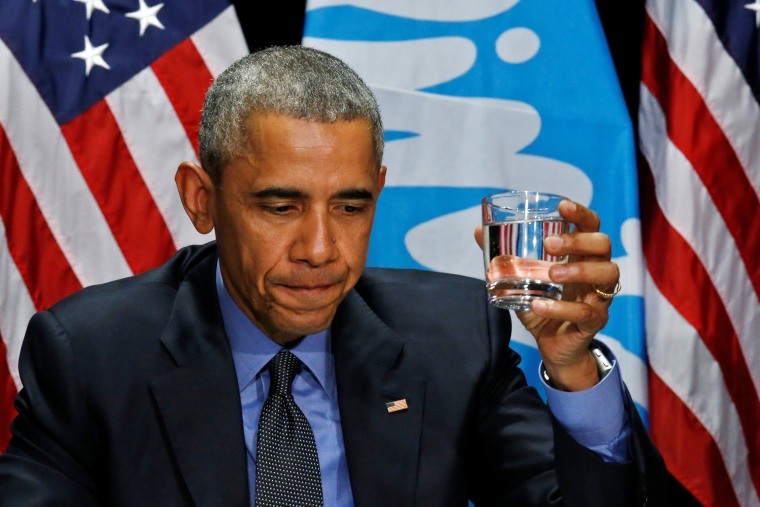 President Obama drinks a glass of filtered water from Flint, Michigan, a city struggling with the effects of lead-poisoned drinking water, during a meeting with local and federal authorities on May 4, 2016. The president said Flint's water is safe, if filtered, and to prove it, he took a sip of it himself. 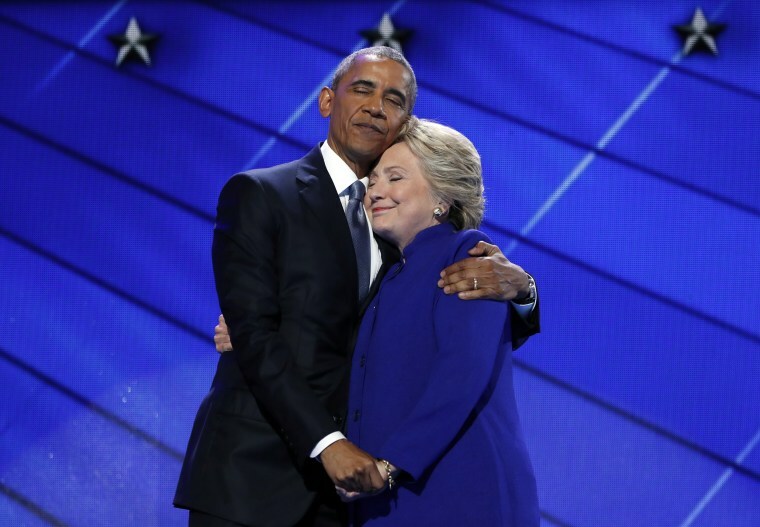 President Obama hugs Democratic presidential candidate Hillary Clinton after addressing the delegates during the third day of the Democratic National Convention in Philadelphia on July 27, 2016. 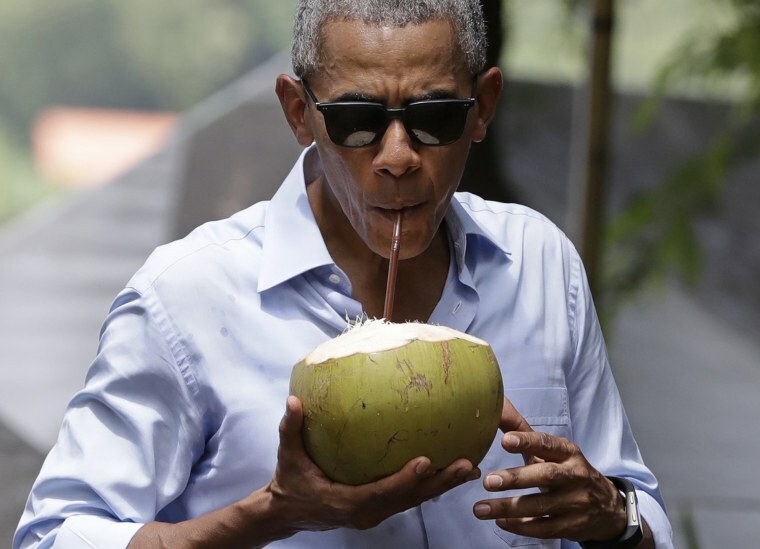 President Obama drinks from a fresh coconut along the banks of the Mekong River in Luang Prabang, Laos, on Sept. 7, 2016. 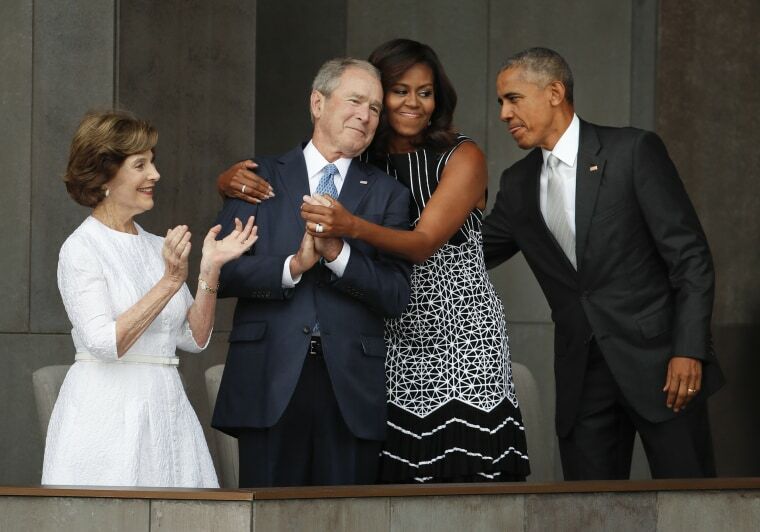 First lady Michelle Obama, center, hugs former President George W. Bush, as President Barack Obama and former first lady Laura Bush look on at the dedication ceremony of the Smithsonian Museum of African American History and Culture on the National Mall in Washington on Sept. 24, 2016. President Barack Obama and President-elect Donald Trump shake hands following their meeting in the Oval Office of the White House in Washington on Nov. 10, 2016. 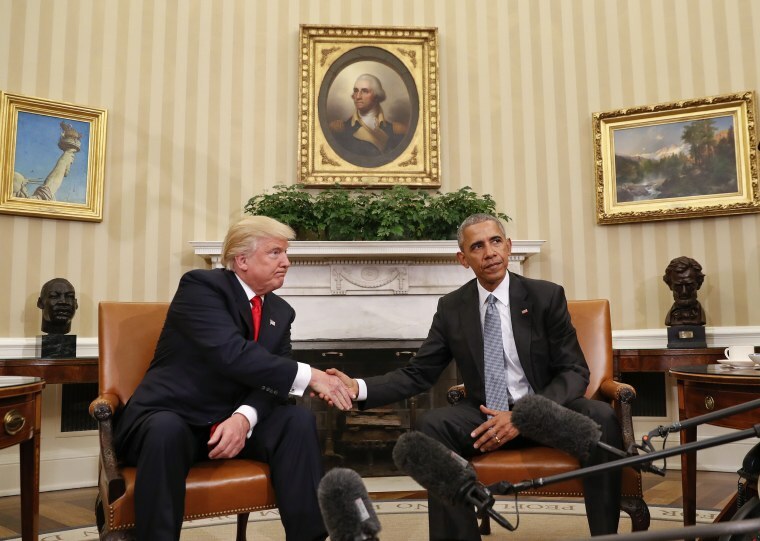 After their first face-to-face meeting, Obama and Trump pledged to work together following a rancorous election. 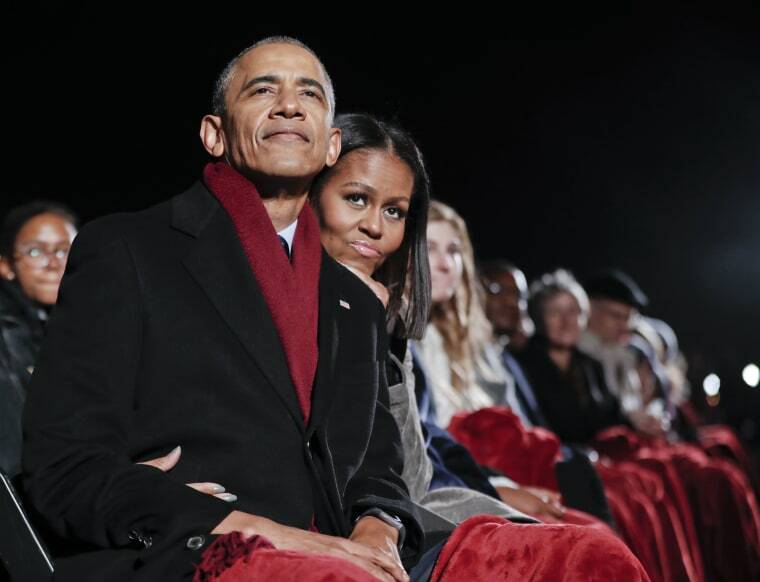 President Barack Obama and first lady Michelle watch the musical performances at the 2016 National Christmas Tree lighting ceremony at the Ellipse near the White House on Dec. 1, 2016.